This article is about songwriter and singer Rick Elias. For Ric Elias, founder of Red Ventures, see Red Ventures. Richard Robert Elias (January 7, 1955 – April 2, 2019) was an American singer and songwriter based in Nashville. A songwriter is a professional that writes lyrics or composes musical compositions for songs. A songwriter can also be called a composer, although the latter term tends to be used mainly for individuals from the classical music genre and film scoring, but is also associated with writing and composing the original musical composition or musical bed. A songwriter that writes the lyrics/words are referred to as lyricist. The pressure from the music industry to produce popular hits means that songwriting is often an activity for which the tasks are distributed between a number of people. For example, a songwriter who excels at writing lyrics might be paired with a songwriter with the task of creating original melodies. Pop songs may be written by group members from the band or by staff writers – songwriters directly employed by music publishers. Some songwriters serve as their own music publishers, while others have outside publishers. A Ragamuffin Band is a musical group founded by Rich Mullins in 1993, when he gathered friends from other bands to back him on his A Liturgy, A Legacy, & A Ragamuffin Band album. The band continued to record and tour with Mullins, and even carried on after his 1997 death. The group's name is derived from Brennan Manning's 1990 book The Ragamuffin Gospel, which defines ragamuffins as "the burdened, the wobbly and weak-kneed, the inconsistent, unsteady disciples... the smart people who know they are stupid... the honest disciples who admit they are scalawags". Elias was born in Louisiana,<interview with Brian Mason> and raised in San Diego, California, eventually attending Azusa Pacific University outside Los Angeles. In 1984, Elias moved to work full-time in L.A. and within a few years would be recording with producer, Niko Bolas. Azusa Pacific University (APU) is a private, evangelical Christian university in Azusa, California. The university was founded in 1899, with classes opening on March 3, 1900, in Whittier, California, and began offering degrees in 1939. The university's seminary, the Graduate School of Theology, holds to a Wesleyan-Arminian doctrinal theology. APU offers more than 100 associate, bachelor's, master's, and doctoral programs on campus, online, and at seven regional locations across Southern California. Niko Bolas is an American music producer, sound engineer, and consultant and business developer in the fields of virtual reality and Internet radio. In 1989, Bolas founded Fakespace Music with Mark Bolas, Ian McDowall and Christian Greuel, which, in 1995, developed the Soundsculpt Toolkit, a software interface that allows music to communicate with the graphical elements of virtual reality. 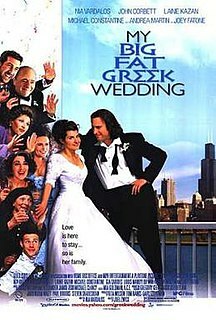 My Big Fat Greek Wedding is a 2002 independent romantic comedy film directed by Joel Zwick and written by Nia Vardalos, who also stars in the film as Fotoula "Toula" Portokalos, a middle class Greek American woman who falls in love with non-Greek upper middle class White Anglo-Saxon Protestant Ian Miller. 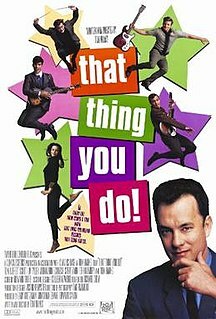 The film received generally positive reviews from critics and, at the 75th Academy Awards, it was nominated for the Academy Award for Best Original Screenplay. Amy Lee Grant is an American singer, songwriter, musician, author and media personality. She is known for performing contemporary Christian music (CCM) and for a successful crossover to pop music in the 1980s and 1990s. She has been referred to as "The Queen of Christian Pop". The Jesus Record is the ninth and final album by American singer and songwriter Rich Mullins, released posthumously on July 21, 1998, ten months after his death. Alarma Records was an imprint of Newpax Records and Frontline Records. Alarma! Records and Tapes was formed in 1983 by the band Daniel Amos with musician Tom Howard for the release of their Doppelgänger album. The name of the label comes from the band's 1981 album ¡Alarma!. KMGRecords was a Christian record label. The label was established in 1997 by Buddy Killen as a subunit of the Killen Music Group / Buddy Killen Enterprises and sold in late 1998 to Cal Turner III, who is related to the Cal Turner of Dollar General stores. Following the sale Buddy Killen continued to consult for the firm. Aaron "The A-Train" Smith is a Nashville-based drummer and percussionist. Jimmy Abegg, also known as Jimmy A, is an American guitarist, composer, director, photographer and artist, currently living in Nashville, Tennessee. "Awesome God" is a contemporary worship song written by Rich Mullins and first recorded on his 1988 album, Winds of Heaven, Stuff of Earth. It was the first single from the album and rose to the number one spot on Christian radio and subsequently became a popular congregational song. Its title is inspired by a biblical expression, variously translated as "Awesome God",, "great" (KJV), among other alternatives. Due to the popularity of the song it became Mullins' signature song. Newsboys are a Christian rock band founded in 1985 in Mooloolaba, Queensland, Australia, by Peter Furler and George Perdikis. They have released 17 studio albums, 6 of which have been certified gold. The band consists of lead vocalist Michael Tait formerly of DC Talk, keyboardist and bassist Jeff Frankenstein, drummer and percussionist Duncan Phillips, and guitarist Jody Davis. In addition to performing music, the band has appeared in the films God's Not Dead,God's Not Dead 2, and God's Not Dead: A Light in Darkness. Across the Sky was a Dove Award-nominated Christian band formed in Nashville, Tennessee during 2001 by Ben Kolarcik and Justin Unger. Both musicians are of the singer-songwriter style. Their self-titled debut was released in 2003, spawning a top ten song and three wide release singles. Across the Sky's music is a style combining light rock, pop, and folk. The group toured and recorded for two years under the Word Records Label before disbanding in 2005 when both artists decided to pursue different career paths. A Liturgy, a Legacy, & a Ragamuffin Band is the seventh album by American singer and songwriter Rich Mullins, released in 1993. The album was very well received, and received the third place in the book CCM Presents: The 100 Greatest Albums in Christian Music (2001). Winds of Heaven, Stuff of Earth is the third album by American singer and songwriter Rich Mullins, released in 1988. The album received 31st place in the book CCM Presents: The 100 Greatest Albums in Christian Music (2001). Mitch McVicker is a GMA Dove Award-winning contemporary Christian Music singer-songwriter. Ashley Cleveland is an American singer/songwriter best known as a background vocalist and Grammy-winning gospel singer. Ashley Cleveland was born in Knoxville, Tennessee. She was married to Kenny Greenberg on April 27, 1991, and has three children. Pictures in the Sky is the second solo album by songwriter Rich Mullins and was released in 1987 on Reunion Records. Brother's Keeper is the eighth studio album by American singer and songwriter Rich Mullins, released in 1995. The discography of Rich Mullins includes 11 studio albums, 7 compilations, 20 singles and 1 musical. The Canticle of the Plains. Here in America is a CD compilation of early songwriting demos and rare live recordings of concert performances given by American singer/songwriter Rich Mullins as he toured across America in 1987 with song collaborator Steve Cudworth (vocals/guitar) and Kyle Stevens (drums/vocals). Released posthumously on May 6, 2003, six years after his death, "Here In America" allows listeners to enjoy excerpts from Rich Mullins concerts prior to the release of "Awesome God" in 1988, which inevitably propelled him, as a recording artist, to a higher level of recognition by the CCM industry. The album comes with a Bonus DVD with two parts - "Live at Studio B", a 1997 concert with a Ragamuffin Band; and "12 Short Stories", which was recorded in February 1994 during a two-day seminar led by Rich Mullins and Beaker at Family Broadcasting Corporation in South Bend, Indiana. Several segments of footage left off the release were made available publicly in 2018 on YouTube due to the efforts of a Mullins' fan online petition the previous year. The World as Best as I Remember It is a two-volume album series by songwriter Rich Mullins. The first volume was released in 1991 on Reunion Records and the second was released in 1992. The first volume received seventh place in the book CCM Presents: The 100 Greatest Albums in Christian Music (2001). Mark Robertson is an American musician and record producer. Robertson is most well known for being a member of Rich Mullins' backing band, A Raggamuffin Band, the frontman of This Train, and bass player and producer of Legendary Shack Shakers. He has also played bass for Brighton, Altar Boys, Flesh Vehicle, JD Wilkes & The Dirt Daubers, The Dixiecrats, The Eskimo Brothers, Derek Hoke, and his newest band Prayer Flags, in which he is the frontman. His primary instrument is upright and electric bass, though he has performed lead and backing vocals for notable projects, including Rich Mullins' final album The Jesus Record and This Train. He produced Rich Mullins' Canticle of the Plains album, Mitch McVicker's first solo recording, Without Looking Down, as well as albums by This Train and The Legendary Shack Shakers. ↑ "CCM (USA) - The 100 Greatest Albums in Christian Music (01) - Acclaimed Music Forums". www.acclaimedmusic.net. Retrieved 2019-04-04. ↑ "Rick Elias Health". Classic Christian 247. Oct 12, 2018. Retrieved October 26, 2018. ↑ "Benefit Concert: Support for Rick Elias, now diagnosed with brain cancer". www.crossrhythms.co.uk. Retrieved April 3, 2019. ↑ Sanford, Jay Allen. "RIP Harlequin and Vision guitarist Rick Elias". www.sandiegoreader.com. Retrieved April 3, 2019.